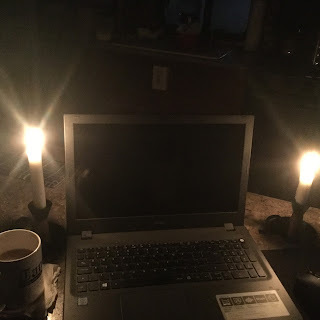 One of the other things I did this weekend was finally solve the puzzle of how to write on a Laptop that does not have a backlit keyboard in the darkness of early morning. I am sure I am not the only person to have experienced the problem of trying to type in a darkened space on a laptop that doesn’t have keys that are lit up from underneath. This means that the only light in the space is that coming from your laptop screen itself. If you have a word processor open, that is a large blast of white light. You would think, this itself would solve the problem, and in a way this can work. If you tilt the screen down so that it is facing the keys more than you, sure. This leaves you looking at the screen on an angle, which is just a pain and is not a long-term solution. I have tried various things to shed some light on the issue (literally) that does not waste Wanda’s main batteries. So, while the simple solution is to just turn on a nearby light, that is not advisable, or a long term solution. I have been through two winters before so I know that in the dead of winter, every scrap of electricity is important and not to be wasted. In the dead of winter, electricity is mostly reserved for running the furnace fan. One of the things I tried was a clip-on bright LED lamp. With small led lamps, while they are bright in the darkness, they can’t compete with the light from the screen. What happens is that your eyes get used to the extra light but still they dominant light is from that screen. In the end, after a few minutes, you see nothing much more than the screen. After all that, you still can’t see the keys, despite having more light around. The solution I came up with is indeed quite low-tech, but quite effective, let me assure you. The candles are quite bright and with the two of them, they do the job perfectly. I can actually see to type without wasting electricity. The candles and candle holders I got at IKEA, and both were not that expensive. Just remember to be careful with open flames that candles are, otherwise it is worth a try if you face a similar situation. I do a lot by candlelight and find it a practical source of light.